Another creamy and flavourful alternative to coffee. 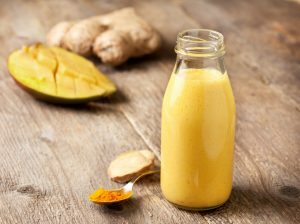 Turmeric contains curcumin which is anti-inflammatory and a potent antioxidant. This is great for boosting the immune system and for easing digestion.It is a great way to start your day or to end your night. It is easy on the eyes, the nose and the palate! Grate the ginger then squeeze the juice out of it into a saucepan. Discard the pulp. Add the remaining ingredients to the saucepan and place over medium heat. Heat through for about 3 to 5 minutes, not letting it come to a boil. Whisk continuously. Carefully transfer into a mason jar and seal with a lid. Shake vigorously for about 30 seconds, or until a foam starts to form. (Note: You can also use a blender for this step, but the turmeric can stain the blender cup.) Pour into glasses through a sieve and enjoy!